This Pew Forum photo, along with another discussion on the aid in dying, can be found here. Joe Turner at the News Tribune asked the same question after receiving the same e-mail from the communications director for the “Death with Dignity” initiative. While we would (of course) prefer that you describe I-1000 as “death with dignity,” we ask that you avoid the emotionally loaded and inaccurate term “assisted suicide,” and instead describe I-1000 in the neutral term approved by Thurston County Superior Court – “aid in dying.” On background, I’ve attached a quick fact sheet on why. As the TNT is doing, I’m asking for your feedback. I would agree with Martens that the term “assisted suicide” is emotionally loaded. I’m not sure it’s inaccurate. The big red dictionary (“Merriam-Webster’s Collegiate Dictionary, Eleventh Edition”) on my desk describes suicide as “the act or an instance of taking one’s own life voluntarily and intentionally esp. by a person of years of discretion and of sound mind.” That would certainly fit the definition being offered in Initiative 1000. Generally, though, we regard suicide as something that happens when someone chooses to end life because of depression, or some such malady. This initiative would argue that in some cases the ending of one’s life voluntarily is something people in certain situations ought to have the right to do. And a judge in Thurston County agreed that the word “suicide” is so loaded that it does create an image that’s inaccurate. That might be true. It’s the same with the word “discrimination.” We discriminate all the time, in choices as simple as picking which can of peas we’ll buy, or whether we prefer fresh peas, instead. The word “discrimination,” though, has commonly come to be attributed to the kind that excludes genders and races. I’d curious to see your thoughts on the matter. Read the extended version of this post, which contains the attachment Martens included. • Reporters and editors often use the term “assisted suicide” to describe a terminally ill patient trying to shorten an intolerable dying process. ==> This term is biased and negative. It also leads doctors, medical organizations, and family members to worry that the incorrect use of the term “suicide” will harm patients and their loved ones. ==> Thurston County Superior Court found this term “loaded” and over-broad, saying that it would cause the public to think of things that the initiative does not allow. For these reasons, the Court ruled that the voters’ pamphlet description of I-1000 must use the impartial term “aid in dying” instead. ==> “Aid in dying” is the impartial language used in the voters’ pamphlet description of I-1000 as approved by Thurston County Superior Court. ==> This correct and unbiased phrase is also the preferred language of the American Medical Student Association, the American Medical Women’s Association, the American Public Health Association, the Washington State Psychological Association and the Oregon Department of Human Services. • “Suicide” is a hurtful and derogatory term that invokes depression and irrationality, terrorist bombers and violence. To label aid in dying as suicide is harmful to both dying patients and their loved ones. ==> There is a fundamental difference between a person who irrationally rejects life, and a person who loves life but faces suffering and prolonged deterioration leading to inevitable and imminent death. In a victory for Washington’s proposed Death With Dignity initiative, a judge on Friday refused to add the words “physician-assisted suicide” to the ballot or official voters pamphlet description. “It is a somewhat loaded term,” said Thurston County Superior Court Judge Chris Wickham. He said it conjures up images of Jack Kevorkian, the Michigan physician who claimed to have helped more than 100 people die before being convicted of murder in one of the cases. Instead of “suicide,” voters will read that Initiative 1000 would allow some terminally ill patients “to request and self-administer lethal medication” prescribed by a doctor. Wickham’s decision largely upheld a description written by the state attorney general’s office. All I am asking for is to have some choice over how I die. Portraying me as suicidal is disrespectful and hurtful to me and my loved ones. It adds insult to injury by dismissing all that I have already endured; the failed attempts for a cure, the progressive decline of my physical state and the anguish which has involved exhaustive reflection and contemplation leading me to this very personal and intimate decision about my own life and how I would like it to end. We ease our animals’ suffering, but not our own. While the term “assisted suicide” may be emotionally charged, it is accurate and far more descriptive than “aid in dying”. The latter is the kind of ambiguous double-speak that robs language of its meaning, kind of like calling abortion a voluntary termination of pregnancy. If one of our local government agencies asked the SUN to describe a tax increase as a “timely adjustment to revenues” and avoid the word “tax” because it is “emotionally charged”, would you comply? I should hope not. Call a spade a spade, not a single-user multimedia gardening implement. I agree that we should call a spade a spade. If we end our suffering pets’ lives by euthanasia, why not call it euthanasia? Assisted dying? Hurried-up dying? Isn’t it really euthanasia? Whatever you call it, it is not for everyone. I am against the thing for humans. What if they changed their minds? What if there was a miracle? I watched my mother die of cancer. She asked me to pray for her death. Besides being in pain, she could no longer eat, and other stuff started to happen. There was no hope. I begged God to take her but she dragged on and on. Finally I asked Mother if she wanted a fatal dose of something, and she said no. Despite all the morphine we administered, she was awake when death came. (Gee, I’m crying now). I just hope I can have enough of something to keep me out, but not to kill me, when there seems to be no hope. My sister-in-law suffered the same way, but she was in a coma at the moment of death. Why can’t we just be put in a coma until the end comes? Playing with the words won’t change the nature of the actions taken when a terminally ill person faces the end of life. We need a detailed and unvarnished discussion, not a shallow attempt to “spin” or “frame” the issues in the hope that a particular initiative will be approved by the voters. Of course it is “suicide” to end one’s life by taking action to die before the natural end would have occurred. But admitting that it is suicide isn’t the end of the matter. If a person refuses medical treatment which would under no foreseeable circumstances extend life more than a few uncomfortable weeks, is that so different from suicide itself? The end comes sooner, but it is a “natural” end. If that same person chooses physician-assisted suicide rather than await the “natural” end, what makes it wrong? I think our difficulty stems from a combination of our general belief that suicide is not a good thing and our quandary in distinguishing the actions of the doctor in such a case from the actions of a person committing homicide. We have to think through it and figure out why society should or should not interfere in the terminally ill person’s decision. It’s not a question that will go away, since we have medical tools which can prolong life under amazing circumstances — but not always in a way that makes sense from the point of view of every patient. 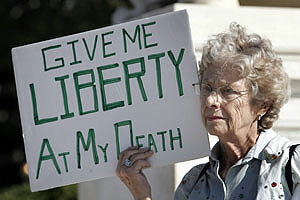 We should also think about the other things which may be affected by authorizing assisted suicide. Consider the case of cancer victim Barbara Wagner in Oregon. The state’s health care program will pay for her assisted suicide but not for chemotherapy which would only extend her life for a little while and perhaps reduce her suffering. Usually, such “slippery slope” arguments are hypothetical, but this one is real and not at all improbable when doctor-assisted suicide exists as an alternative to other, far more costly, actions. Darren Coffman directs the state Health Services Commission, an 11-member panel of doctors, social service workers, public health nurses and consumer representatives that sets policy for the Oregon Health Plan. One long-standing rule of thumb developed by commission is known as the 5-year, 5 percent rule: Any treatment that doesn’t provide at least a 5 percent chance of survival after 5 years won’t be approved. Last fall, he said, the commission added an example to its guidelines, stating that coverage of palliative care for patients with advanced cancer would not include chemotherapy or surgical intervention intended primarily to prolong life or alter disease progression. Palliative care is intended to provide comfort and relieve symptoms such as pain and shortness of breath for patients with a fatal prognosis. Education is the bet vehicle for getting others to understand the underlying message and issue, not shuffling terminology. Using the term ‘irrational’ to describe other suicides isn’t likely to win points, either. It can be subjective, as some may argue the same for those in such pain or agony so as to desire this option. After all, there are many studies which explore the effects of chronic pain and/or illness on its subjects. Focusing on those who are insulted or resentful of a term isn’t a strong lobbying position. Packaging it to elicit sympathy is reasonable to the degree it can change legislation, but there are clearly opponents who don’t care what it’s called and object to the practise. I wonder how the dying person feels about losing control of bodily functions as they live through the death process? Whatever dignity they had disappears with diaper changes and fanny cleaning. The catheter bag hanging alongside the bed is the first thing a visitor will see when they come to visit. Few wish their loved one to suffer as they wait out the process but no terminally ill person should be denied the right to choose a medically assisted humane end to the ongoing process that strips a person of something many held dear during their lifetime – dignity and sense of self. During the dying process, the patient is drugged for the pain – good – but being drugged makes it more difficult to move and someone must turn the ‘body’ every so often. Using a catheter and the necessary tube running from the patient’s ‘private area’ across the bed and down the side into a bag means the patients beloved long silky gowns might get twisted in the cord and not practical for the caregiver. Short hospital gowns are used for convenience and the caregiver slowly becomes desensitized and careless with the patients modesty as she/he does their job. Try as the shy patient might try to pluck and pull the short gown back down over their exposed private area they don’t have the strength. The shy patient suffers from the exposure and feels humiliated. Over time the patient becomes desensitized to the exposure and loses another sense of self. The patient becomes unable to get out of bed and on the toilet … and is introduced to diapers and the need to mess themselves and live with the indignity of being washed as many of them cleaned up poopy diapered babies in days long past. The daily bathtub type patient may ask if it is possible to take a bath. The patient is told no..it is no longer possible. Yes the patient is made comfortable as their system begins to shut down. But people are more than a body …people have essence and spirit. Both are stripped away before they pass on. Death with dignity equals a medical assisted end to a life impossible to live. As I see it. I find it amazing that many that object to assisted death will use religious reasoning. They seem to think it is ok to take it into our hands to save a life but not to end it. These people are selfish and narrow minded. They think their ways should be imposed on others. My mother worried and worried that she would be made to linger in a horrible state of pain and terror. She begged me to not let this happen. There are those that think they know what God wants and would make others suffer to meet their dogmatic standards. Shame on them. John you can not tell the difference between giving food and water and taking life away from a person . Ok call me selfish and sf centered ? But I can’t help but wonder if people with your compassion and ability to understand get jobs in state healthcare and are the ones who explain to people their alternatives of life and death . Thanks Bob , some good points . Leaving death to the person involved is not really all there is to this . Many factors to it , especially when we are dealing with medical care and our ability to pay for it , or the limitations on the FREE healthcare we receive . AP article about a Lung cancer patient living in Springfield, Oregon was recently notified that her oncologist prescribed medication that would slow the growth of cancer but would not be covered by the Oregon Health Plan–her state managed and funded health insurance plan. There are no easy answers, no perfect solution. Carefully monitored drugs will reduce/eliminate pain in the terminally ill until they pass. I opted for an operation on one of my dogs with cancer and after she healed from the operation she was her old self…feeling good and happy…a wonderful two weeks but the cancer came back. Had she been a person and needed others to pay for the operation…(excluding family opinion) was the operation a good use of limited medical funds? A dear friend was diagnosed with malignant melanoma and was prescribed an aggressive drug- the same given to Maureen Reagan. My friend quit taking the very expensive drug after three months because it made her too sick to function. As it happens she is still alive, active and functioning well – the cancer seemingly at bay. It was no accident that God gave us a brain and no guarantees. To add in the same letter of the drug refusal to the Oregon patient, that the state would pay the assisted suicide costs is beyond understanding their cruelty and lack of empathy. Terminally ill people should have the choice of using a medically assisted means to a dignified end ..in my opinion. I’ve always called it Death With Dignity. My grandfather had advanced neurological degeneration and Parkinson’s combined with advance emphysema. Death with Dignity was not an option for us since Washington state does not have a law legalizing it but having my grandfather hang on in pain and suffering for so many years made this issue really hit home for me. I am supporting this measure because should I ever end up in a situation like my grandfather did I would not want to lie in pain and suffering for so many long years. To me keeping someone I love in pain for such a long time was a moral outrage for me. When he passed on it was a time of remembrance and a celebration of his life and that his pain finally ended. My grandmother who is 92 years young and pretty healthy for her age has a do-not resuscitate waver that she wanted after seeing her husband suffer for so long. My father made it crystal clear that when he signed his living will that he would not want to be kept barely alive artificially by machines and drugs like my grandfather. Matters of life and death are not as black and white but I certainly do not want to government to impose in on what is such a traumatic event.